Palacio de Valle was once home to a wealthy sugar baron. 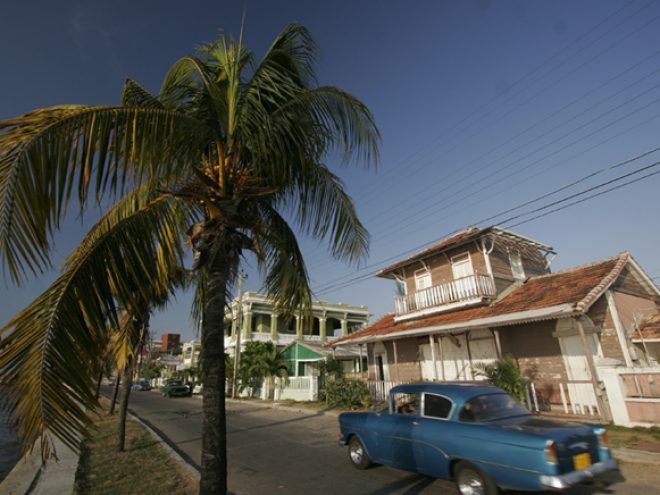 The ghosts of Cuba’s past, when rich sugar barons built elaborate mansions and planted out vast estates, still seem to linger in the sultry Caribbean air, especially around the central Cuban city of Cienfuegos. A relatively young town in Cuban terms, Cienfuegos was founded in 1819 by French settlers from America and Haiti. As a result there’s a decidedly French provincial town feel about it and because of Cuba’s isolation for so long, the entire town is almost as it was in its 19th century glory days. There are few modern buildings to spoil its neo-classical facades and collection of palaces and public buildings. Parque Marti, the heart of the city, is flanked by stunning buildings, including an Italian-style theatre where – in the early 1900s – world-renowned opera stars Sarah Bernhardt and Enrico Caruso sang, and a palace built for one of the region’s many sugar magnates. Among the plantations that surrounded the city was one owned by the Hershey family, best known for its chocolate. The entire old city of Cienfuegos is a UNESCO world heritage site and the square is an example of why it is considered a global treasure. It is also testament to the wealth that sugar once brought to the region. Cuba was once the world’s leading sugar producer – now it exports a mere two million or so tonnes a year, and many of the ingenious (sugar factories) lie in ruins in the countryside. There’s a bar and cafe in one of the oldest buildings around the square. We sat on the terrace and drank minty mojito cocktails while the locals drew up in their Chevys and Cadillacs beside the band rotunda opposite. Drivers in skinny jeans and t-shirts leaned casually against the bonnets, waiting for their cars (and themselves) to be admired by visitors, who would also be gently encouraged to part with a few Cuban pesos for the privilege. Inevitably there was an ensemble playing on the terrace, working its way inexorably towards us, the singer with a stash of CDs tucked in his jacket. While they crooned through the ubiquitous Guantanamera we noticed a man stealing what seemed to be furtive looks at my husband and then appearing to make notes. Was this a brush with Cuban intelligence services? If so, he wasn’t being very covert. But after a few minutes of feverish activity he appeared at our table with a colour-washed caricature of Derek sipping his drink. We paid up willingly but he slipped over the balustrade before the musicians reached us. Admirable though the Cubans’ inventiveness at extracting money from tourists is, we’d had to impose a limit on our daily contributions to the “under-the-table” economy. Cienfuegos is also famed for its location on a bay that was once called the Pearl of the South. The first European to see it was Christopher Columbus in 1494. Today the sea still sparkles and the 19th-century palaces of the sugar barons which line the narrow spit that juts into the bay are receiving some much needed restoration work. But, you do have to ignore the signs of heavy industry across the bay – a legacy of Soviet-era contributions, which include a now permanently mothballed nuclear power station. Near the end of the spit is one of the most striking of the palaces. It was built by a rich sugar merchant Acisclo del Valle Blanco, who was one of the wealthiest men in Cuba at the time. Begun in 1913 it took four years to build and the result is extraordinary as it combines Gothic, Venetian and neo-Moorish styles in the one construction. Not content to try to mix the three, Senor Blanco decreed he wanted three towers, each of a different type, so the two-storey arched and porticoed palace has three distinctive towers symbolising power, religion and love. Dictator Fulgencio Batista, who was ousted by Fidel Castro, had planned to turn this confection into a casino but the revolution intervened and today it is a restaurant. Visitors are allowed to roam through the dining areas, climb to the roof terrace to admire the towers and the bay and indulge in free pina coladas. Cocktail bars are an integral part of most Cuban sightseeing destinations. I glanced at the time as the barman handed me mine and discovered it was 10.30am. Cienfuegos is home to one of Cuba’s main fishing fleets and as a result, the nearby yacht club restaurant was offering a mountain of fresh prawns for lunch. Another band was in residence, Guatanamera on the playlist again, but it didn’t really matter when the prawns just keep coming and the sun sparkles on the pearl of the south. The sugar millionaires of Cienfuegos left the region with another beautiful legacy – the Jardin Botanico Soledad. This garden, which is more akin to what we know as an arboretum, was originally established by sugar plantation owner Edwin Atkins in 1912 as a sugar cane research centre on a corner of his sugar plantation. However, he seemed to have become fascinated with tropical trees and plants in general and soon more than four hectares was filled with exotic vegetation. The University of Harvard took over the garden in 1919. It is now the property of the Cuban government and is one of the largest botanical gardens in Latin America, covering about 90 hectares. The main drive through the park is lined with Cuba’s national plant the Royal Palm but there are more than 250 other palm species here, including one known as the pregnant palm because it has a swollen middle. There are massive fig or banyan trees, bamboo of prodigious proportions and splendidly exotic tropical flowering plants. One of the garden’s botanists showed us around but was reduced to being a supporting act when we spotted half a dozen emerald hummingbirds drinking nectar from one of the flowering trees. These tiny birds move in a blur of incredibly rapid wing movement and with their iridescent plumage seem to hover like tiny jewels among the trees. Hummingbirds are the only birds in the world that can fly backwards. We stood entranced until a polite cough reminded us we were supposed to be on a botanical safari.